Hare Krishna! I've been living in India since 1993. I am involved in research and publishing. > diminish as Kali Yuga progresses. You are aware of that statement, right? > so) the only fully spiritually potent dhama. > all the less so as time progresses? > Puri and Vrindavana will diminish? > Thakura is saying. What to make of his statement? > What's your take on it? In Kali-yuga, all holy places are extremely weak; only Nabadwip is supremely strong. By the Lord's desire, however, this tīrtha was invisible for a long time and its glories lay unrevealed. When the influence of Kali-yuga increased, naturally the holy places lost their power. “I will manifest Nabadwip Dham and break the poison teeth of Kali by performing congregational chanting of the holy names. Based on the above it is clear that the dhama will be manifest wherever the holy names are present. A little caveat on that: Of course this means “present” where the names are properly chanted. Kali has ten arrows which he uses to attack the movement of Mahaprabhu. These are the ten offenses to the holy name. If those offenses are not present then the name will drive Kali out. 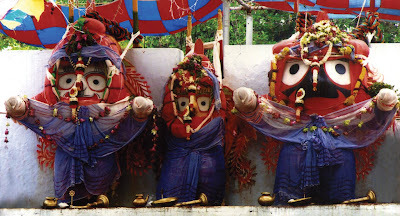 On the other hand if they are present then Kali will enter even into the Dham and even into what appears to be Mahaprabhu’s movement. Puri and Vrindavan are both nitya-dhamas, eternal abodes. There is no question of them losing potency. However, they may be covered over and lost to mundane vision. This certainly seems to be happening with all the dhamas, save and except those places where the devotees are chanting the holy names. I hope that this is some help for you and that all is well for your bhajan. We had nearly 10 GB of downloads in 2 days to the old link, finishing off our limit with our Divshare account. A sastric look at the problem of false gurus and materialistic persons donning the dress of devotees. 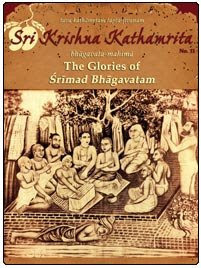 This three part class given by Madhavananda Das in December 2009, offers some commentary on Sri Krishna Kathamrita magazine issue 10 entitled, False Gurus, Institutions and the Holy Name. [By observing Śrī Kṛṣṇa Janmāṣṭamī] one becomes free from the sinful reactions committed in seven lives. One gets good children, good health and great wealth.... One will not have to fear enemies, and will get sufficient rainfall and never have to suffer from drought. One will not have to fear natural calamities, hellish conditions, snakes, disease, or the attacks of rogues and thieves. 1) Bhaya — out of fear. 2) Āśā — for satisfying material aspirations. 3) Kartavya-buddhi — out of a sense of duty (literally, “a mentality of what should be done”). 4) Rāga — out of genuine attraction for the Lord. Those who take to worship of the Lord out of bhaya, āśā or kartavya-buddhi are not on such a pure level. Those who worship the Lord according to rāga are real worshipers.... Bhaya o āśā nitāsta heya — Bhaya and āśā are extremely low class. When a practioner’s intelligence becomes clear, he gives up bhaya and āśā, and kartavya-buddhi becomes his sole motive. As long as rāga towards the Lord has not appeared, the devotee should not give up worship according to kartavya-buddhi. From this sense of duty, kartavya-buddhi, two considerations arise: vidhi-samāna, respect for the rules, and avidhi-parityāga, avoidance of those things contrary to the rules. There are so many rules and regulations, and if one at all wants to understand Krishna, he must follow the regulative principles described in the authoritative literature. One can perform penance in accordance with those principles. For example, to undergo serious penances one may observe fasting on Janmāṣṭamī, the day on which Krishna appeared, and on the two days of Ekādaśī (the eleventh day after the new moon and the eleventh day after the full moon). Those foodstuffs and beverages that are offered to Krishna for his pleasure are transcendental and one should never try to distinguish them as eatables and non-eatables. Offerings to Sri Hari are transcendental, incorruptible, and non-different from Vishnu. O brahmins, those who have a perverted mentality, and think offerings to Sri Hari to be material, will suffer from leprosy, and reside in hell after losing their wife and children. Even if one is in an unclean state of body or mind, or engaged in irreligious acts, he should eat mahā-prasāda whenever it is available to him. There is no need to deliberate on this. — Bhagavad-gītā As It Is. English translation and commentary by A.C. Bhaktivedanta Swami Prabhupada. Bhaktivedanta Book Trust. Bombay. 1995. — Bhaktivinode Thakur. Śrī Caitanya-śikṣāmṛta. Sri Chaitanya Math. Mayapur. Bengali. Gaurabda 420. — Gauḍīya-vaiṣṇava-kaṇṭhahāra. Compiled by Atindriya Bhaktigunakara. Sri Chaitanya Math. Mayapur. 1960. Bengali. — Sanatan Goswami. Śrī Hari-bhakti-vilāsa. English translation by Bhumipati Das. Rasbihari Lal & Sons. 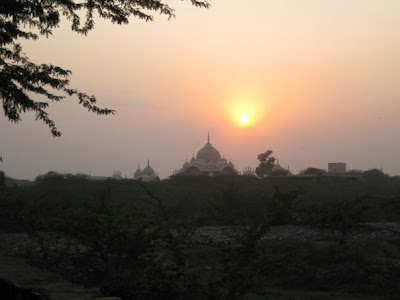 Vrindavan. 2005. — Sanatan Goswami. 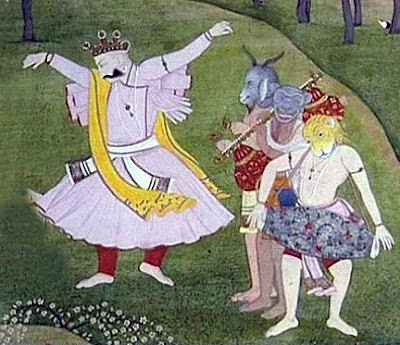 Śrī Hari-bhakti-vilāsa. Sanskrit with Bengali translation by Kanailal Adhikari. 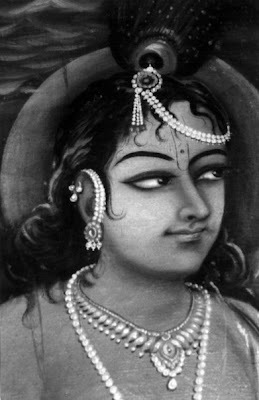 Sri Chaitanya Gaudiya Math. Mayapur. 2000. -- The above photo is by Sudarshan Das Mahapatra from our upcoming issue of Sri Krishna Kathamrita magazine. ISKCON news recently gave a write up on Gopal Jiu Publications on the occasion of the 200th issue of Bindu with a very nice article. Check it out!